Every nation has its own wedding traditions, especially when it comes to such an ancient people as Armenians. Modern weddings, of course, differ from the traditional weddings of medieval Armenia, but there are several traditions that have survived to this day and are sacredly honored by the people. Taking part in the Armenian wedding is a real fun and unforgettable emotions. What awaits you at a traditional Armenian wedding? The Armenian wedding does not begin from the day of the wedding, but from matchmaking. The bride, according to the customs, was chosen by the mother of the groom. By tradition, relatives (only men) of the groom wooed and it happened without the presence of the groom. If several suitors were wedded, matchmakers would come in one day, arrange presents and sit at one table. It was for the bride – who to choose and whom to refuse. Of course, today this tradition is forgotten, but the tradition of choosing a bride and matchmaking is still preserved. Engagement is the next step, which is also important. During the engagement, the bride gets gifts, mostly gold and the date of the wedding is negotiated. Now the families of the bride and groom are considered relatives. During the engagement, they choose the main person at the wedding and in the life of the newlyweds – qavor (godfather), the person who must accompany the family throughout life giving wise advice. Modern wedding begins by dressing the groom in a suit. Azab Bashi (friend of the groom) must constantly be near the groom. During the fun, the akhves (messenger) steals the chicken, before the guests arrive to the bride’s house and notify that the bridegroom will soon arrive. Today, the Akhves is the leading car that makes a lot of noise and lets the bride’s relatives and neighbors know about the arrival of the groom. Arriving at the bride’s house, the women from the groom’s side begin to dress the bride in a wedding dress. It is accompanied by a traditional song. During dressing, the bride’s brother and younger relative steal the bride’s shoe and hide it. The one who finds the shoe receives money from qavor. After this, the women call the groom into the room. It’s time to go to church for a wedding, but before the groom takes the bride out of his father’s door, the brother of the bride fences off the road with a knife at the wall. Having received a reward from qavor, the brother misses the bride and groom. The wedding ceremony is held in the church during which the groom and the bride give official promises. Above the heads of the bride and groom the godfather and godmother hold the crowns (the bride and groom are the king and the queen). After the ceremony, the guests go to the groom’s house. The groom’s mother is waiting before the entrance to the house. She covers the shoulders of the bride and her son with lavash and gives honey to taste. This tradition has remained unchanged to this day. Another cheerful tradition associated with the groom’s parents is a game of struggle. In the yard parents arrange a fight, after which the wife kisses her husband as a sign of obedience.. 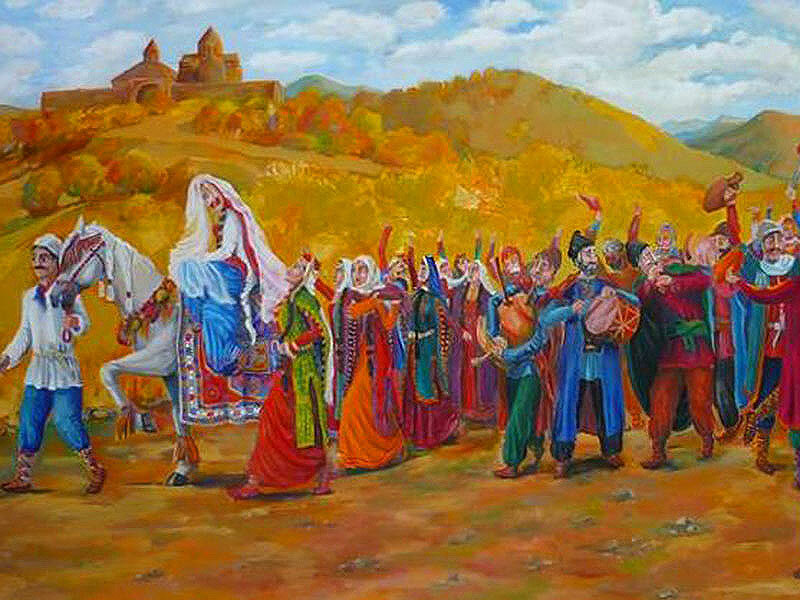 The Armenian traditional wedding table is full of dishes: traditionally they are served with shish kebab, the serving is accompanied by dancing. The luxurious table is full of treats; sweets, fruit, alcoholic beverages. It is during Armenian weddings that you understand how generous the Armenian soul is. Throughout the fun, qavor and the elder of the bride and groom’s families speak toasts and wishes. Guests traditionally give the bride and groom golden jewelry and money. In the middle of the fiest, the bride and groom present tarosik to guests (small souvenirs from the wedding) to single girls and guys passing a piece of happiness and luck. In modern Armenian weddings, they hold a famous bouquet throw, dance of the bride and groom, cutting of wedding cake and firework. Wedding party lasts all night, and the next day, after the wedding night, a messenger with a red apple ( the symbol of virginity of bride) was sent to the bride’s house. In the morning, khash is served in the groom’s house. Young boys and girls gathered and continued the party.